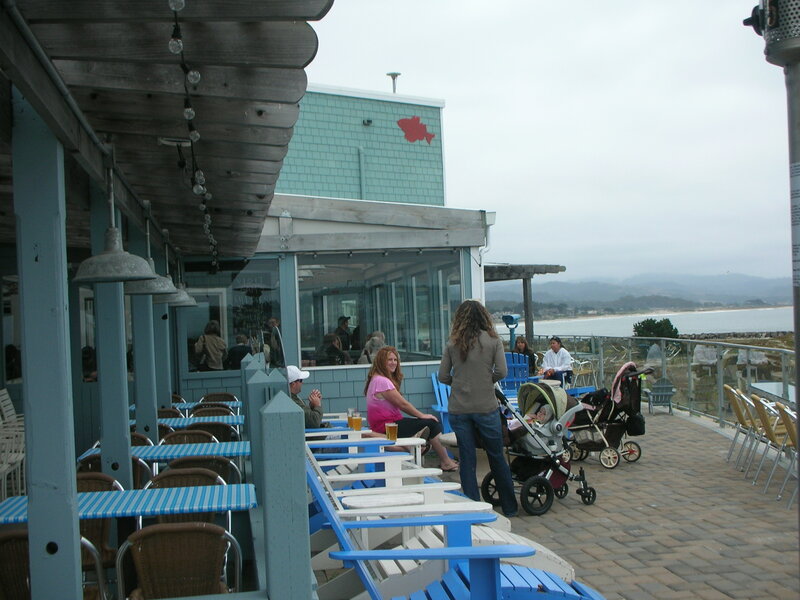 We went over to Half Moon Bay this past Saturday for a friend’s birthday lunch. 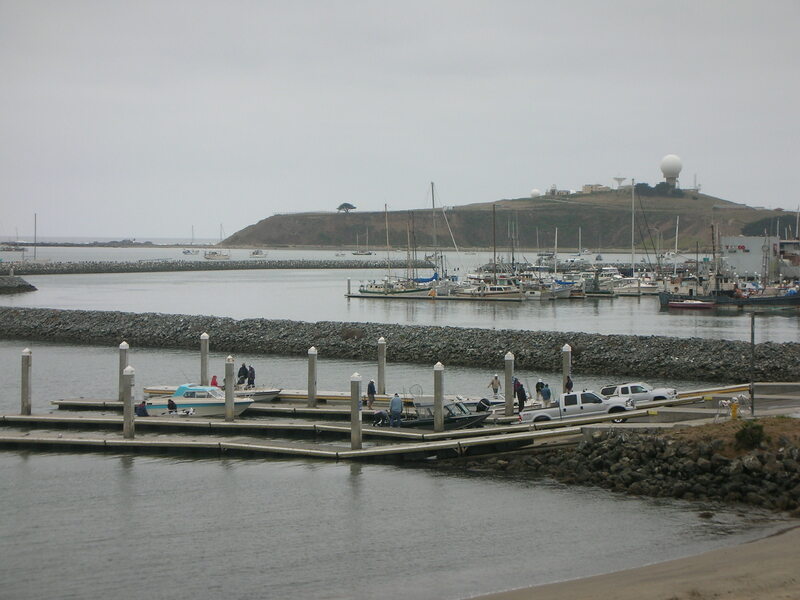 Half Moon Bay is only about 45 minutes south of San Francisco and 20 minutes west of heavily populated San Mateo. Even though it is so close, once in the small coastal town you feel completely removed from every day worries. It makes for a perfect day or overnight trip. Getting to Half Moon Bay already provides half the adventure. 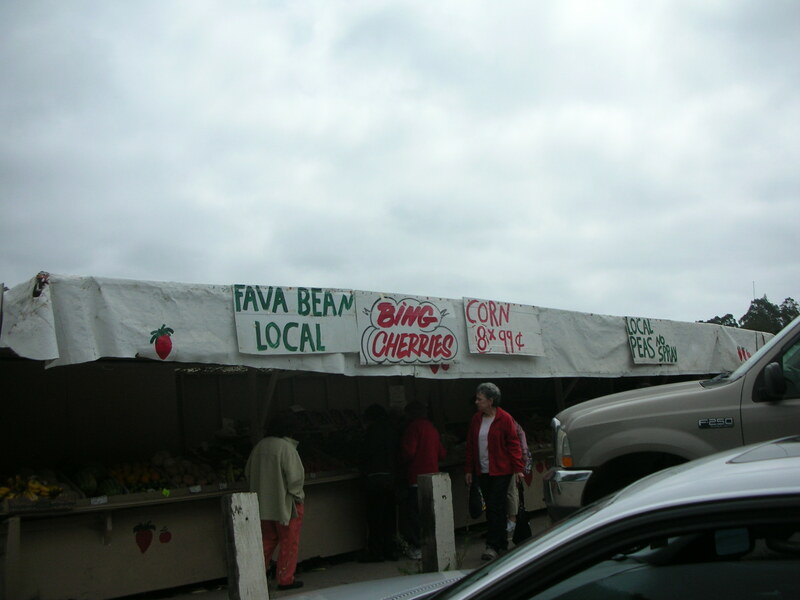 Home grown businesses line the 92 connecting San Mateo and Half Moon Bay. There are nurseries, ranches, a winery, and numerous fruit and vegetable stands. 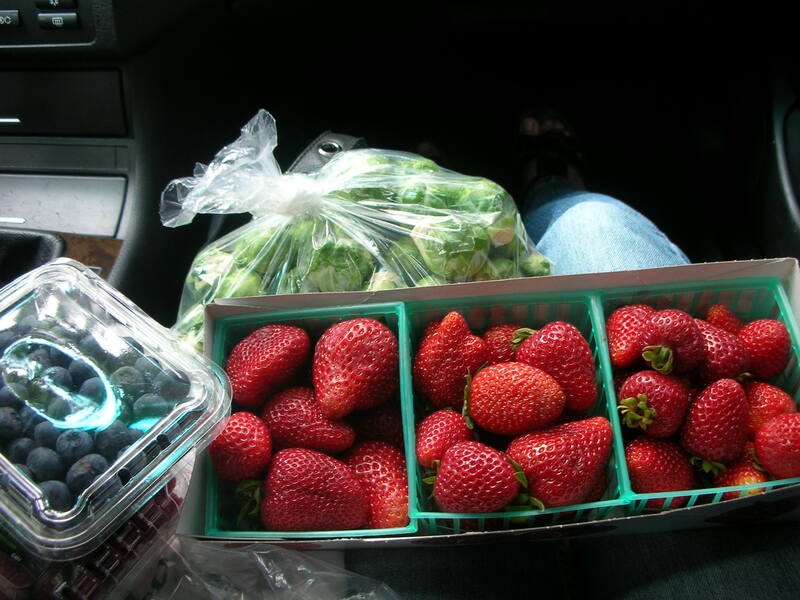 We purchased two small containers of blueberries, one container of raspberries, about one lb of brussels sprouts, and a lot of organic strawberries for about $8. 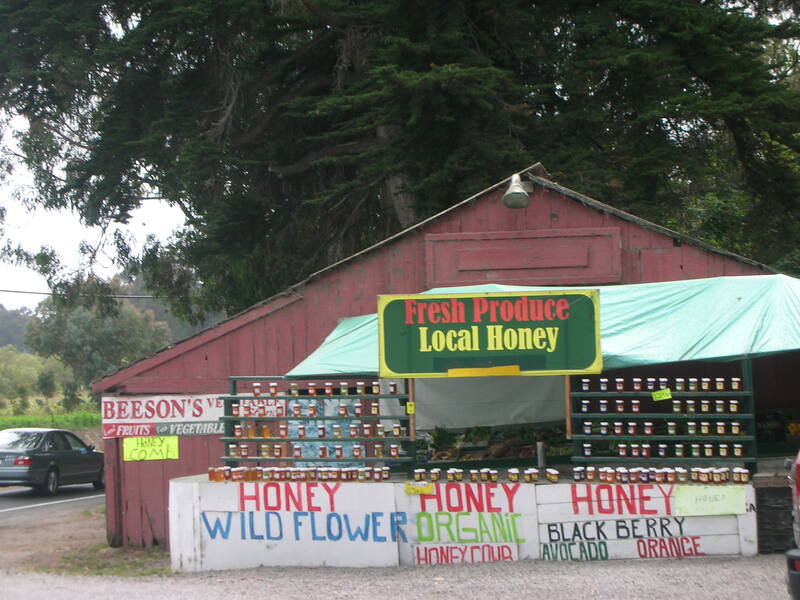 I was very tempted to purchase honey at Beeson’s (where we got the raspberries and strawberries) as well but it was quite costly at $12 a jar. That will have to wait until Hubby and I strike it rich! Beaches line Half Moon Bay and it is easy to drive along Hwy 1 until it strikes your fancy to pull over for beach access, signs for which are clearly posted. 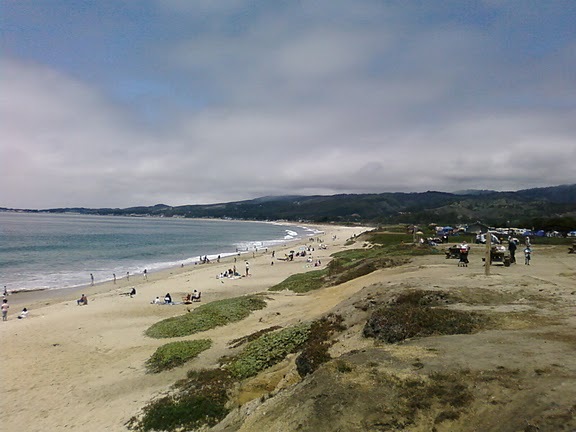 Half Moon Bay State Beach stretches four miles and is the most visited. The weather is often windy and cloudy, so people don’t go there to sunbathe but to just enjoy the open space. 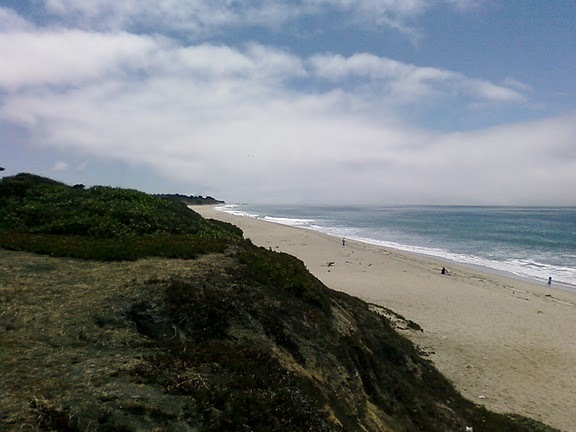 Half Moon Bay offers a multitude of activities, including fishing, surfing, hiking, horseback riding, and golf. 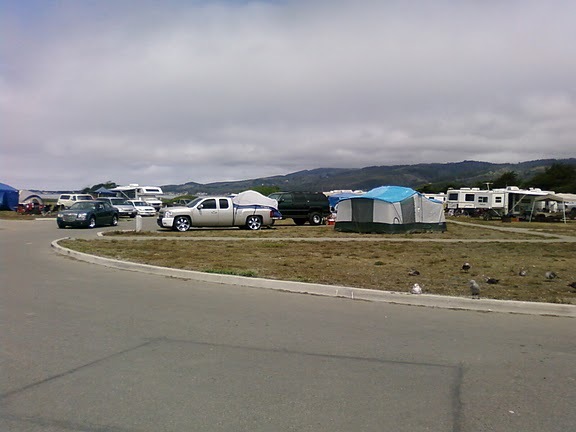 Some people also camp off of State Beach. I personally don’t understand the lure of camping in a parking lot but to each his own. 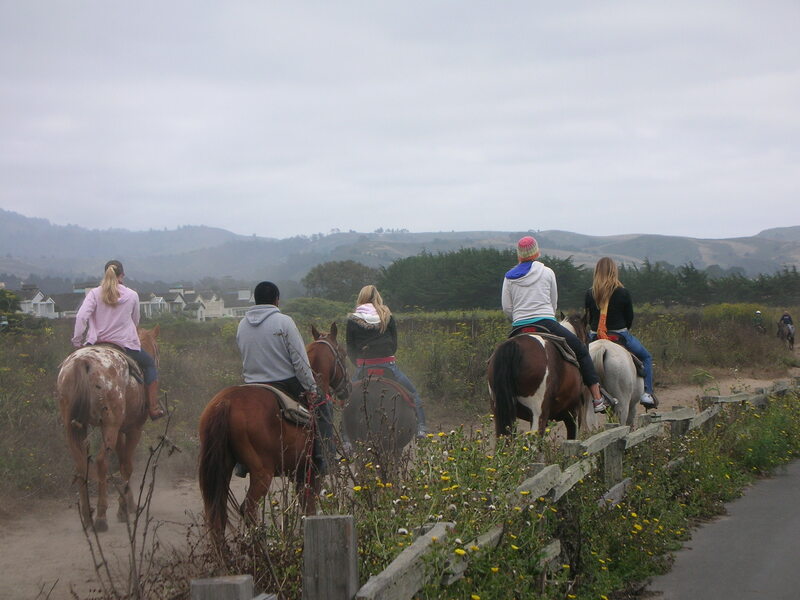 Here are some horseback riders passing by on Half Moon Bay Coastal Trail, which runs parallel to the beach. 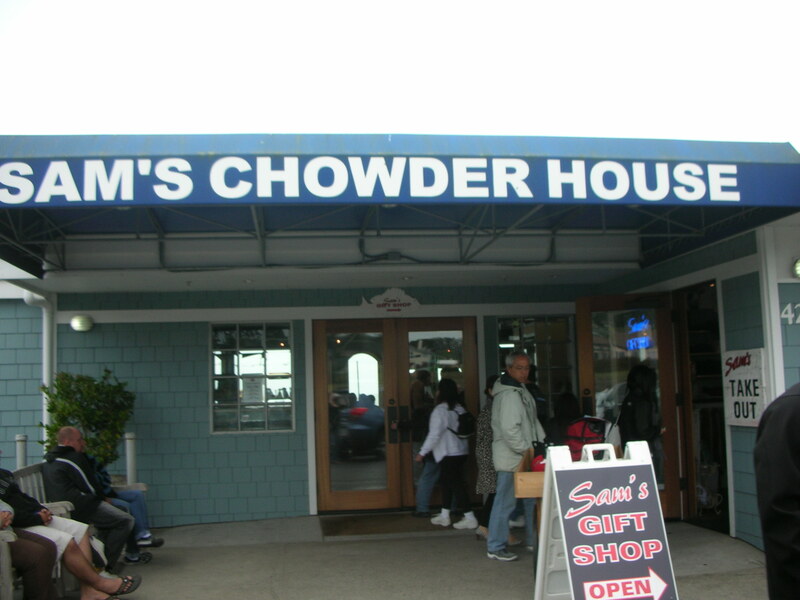 We had lunch at Sam’s Chowder House, a huge restaurant with an outside patio complete with fire pits. 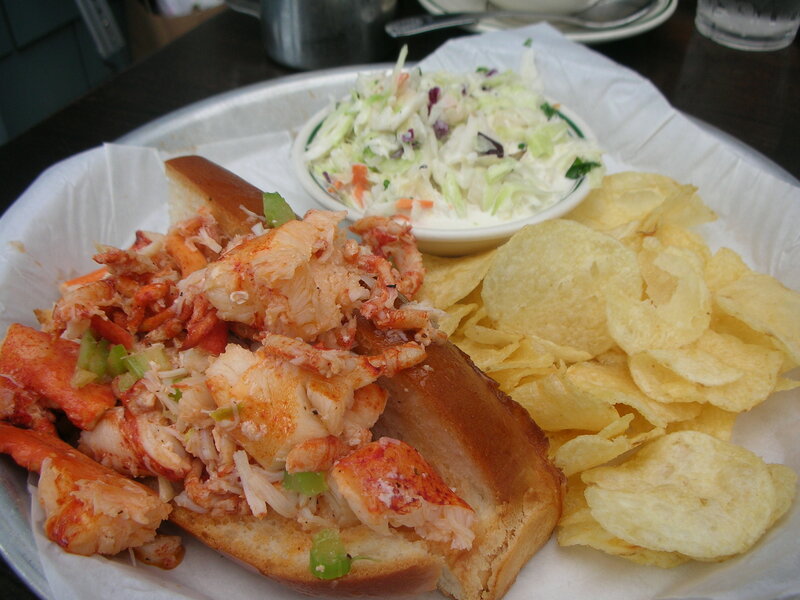 Sam’s Chowder House is known for its lobster roll, with a live lobster tank at the front of the restaurant, so we just had to order it. Around 12pm the restaurant was packed with groups of people waiting for a table. The succulent and plump morsels of lobster was worth the $20. 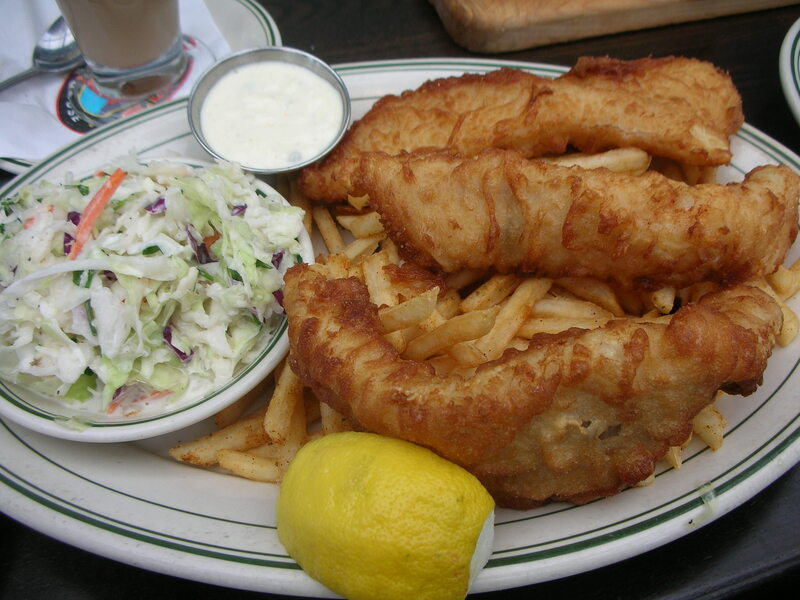 The fish and chips weren’t oily at all although the fries were soggy. It’s been a while since I ate heavy foods like this so I promptly fell asleep in the car during the drive back home. Perhaps this year we will return for the annual Art & Pumpkin festival. It’s a huge festival with live music, art stands, all the fried food you can stomach, haunted houses for the kiddies, and of course pumpkins and gourds over 1,000 pounds. Seriously, what do they feed them??? It’s one of the few places you can eat pumpkin pie and drink pumpkin beer at the same time. Over 300,000 people attend the visit so go early to avoid the crush of traffic. In a bid to escape the stand still traffic last year, Hubby announced that we were taking the Road to Grandma’s House, a secret dirt road he spotted on a map and that will bypass all the traffic. As you can guess, we never made it to Grandma’s House. We ended up back in line with the traffic before my sister started puking from the turns. Undeterred, Hubby tried once again to get on the elusive road when it was time to go home. Yet again, he was defeated. While the Pumpkin festival is great fun, Half Moon Bay is at it’s best at other times of the year, when your biggest decision will be whether to just sit and watch the surfers catch a wave or leisurely stroll down Main Street past cutesy boutiques and casual eateries.